Similar sounding words that have very different meanings. With these numbers being tossed around a lot these days in financial, statistical and general media reports, the general public could be forgiven for dismissing or not really understanding the impact and implications these similar sounding words really represent. I remember in the late 80s reading a publication about the then U.S. national debt and seeing that dollar amount compared to seconds in time. My memory of the exact time, numbers and publication has escaped me now but I do remember being very surprised by the results. So today I decided (with help from Google) to do my own research and number crunching and I have to admit, the results have once again surprised me and in fact, seem a lot more daunting than they did back then. Not just because the current U.S. national debt is a LOT more substantial, but because my calculations differ a lot from my memory of the article. So, all though they sound similar, that's where the similarity ends. If you started counting every second of time from now, you will reach one million seconds in approximately 11 days and 20 hours. Or 11.575 days. Likewise, you could blow a million dollars by spending $1 every second, 24 hours a day, for 11.575 days. Doesn't sound that long does it! Lets replace the M with a B. The difference between an M and a B is enormous, from under 2 weeks to over 30 years. What will replacing a B with a Tr do? Now this is where the mind starts to boggle and the head starts to hurt. Replace B with Tr and the scale in time moves from taking 31.71 years to an amazing 31,688 years. Yes, that’s "thirty one thousand six hundred and eighty eight years"
To make sure I had the right "Trillion", I turned to NASA for the answer. "In the U.S., one trillion is written as the number "1" followed by 12 zeros (1,000,000,000,000)." So I recalculated it in Google, this time using the numerical form of one Trillion and got the same result. According to the "US Debt Clock", the current U.S. national debt sits at 12.1 Trillion dollars and steadily rising (which is twice what I thought it was). Assuming their correct, if the US were to start paying $12.10c every second, 24 hours a day 7 days a week 365 days a year, it will take 31,688 years to pay it off. (Not taking into account added interest or future debt). A couple of other numbers I found interesting while researching this article, is that light travels at approximately 186,000 miles per second and there are approximately 32 million seconds in a year. 12 Trillion divided by 186,000 = 64.5 Million. With that in mind, I wish you all a very Merry Christmas. Twitter hacked - Down, but not out. Seems the popular micro blogging site Twitter has temporarily been taken down by hackers. I was able to find a few tweets getting through using Google new real time search option, it seems tweets can still be sent using desktop applications like tweet deck etc. Twitter.com back online as of 7:08am Friday (GMT) but status.twitter.com still does not resolve. 7:32am Friday (GMT) Status.twitter.com now resolves, but only mentions and unplanned outage and nothing about being hacked. We are working to recovery from an unplanned downtime and will update more as we learn the cause of this outage. Update 7:40am Friday (GMT): Twitter’s DNS records were temporarily compromised but have now been fixed. We are looking into the underlying cause and will update with more information soon. The company founded in April 1996 that has been providing "Free web traffic metrics, top sites lists, site demographics, hot urls, and more", have just launched a "User Reviews" section to there very informative site, letting users (and webmasters alike) rate and review the sites they own.. I mean visit. Although you do need to be logged in before you are able to rate and review a website, you don't need to register an account with Alexa, you can simply "Connect with facebook"
A few years ago, I started my first site. I got a basic windows hosting package to begin with, then a few months later upgraded to the next level hosting package (still windows) so I could host multiple domains in the one account. This has been working fine so far, although there are a couple of things that concern me about this setup, I have not noticed any indexing problems so I have not worried to much about it. The domain I used to build the first site on became the main domain for the account, and any other sites I need to add, are added to a sub folders in the main account, and domains are pointed to these folders. The reason I want to upgrade hosting is because one of my sites that is nested in one of the sub folders, has been steadily growing since I started it just over a year ago, it now receives 10x more traffic than the main site, so I think it's time to get this site its own hosting. And that's where I need some advice. The site does not use much bandwidth (around 20 gig a month) and is plain/static HTML, no database stuff, So I assume it does not need much server power to run it. I have whos.amung.us installed on the site, and I can see that there are between 90 and 190 people on the site at any given time with an average of around 115. These numbers are somewhat of a concern me. I have only had to ring my host once since I got the account, and while I was on the phone to them, I asked a few questions and found out that even though I get 1.5TB of bandwidth per month for the account (which I will probably never need), I can only have 100 simultaneous connections/downloads at any given time on all sites in that account. I was somewhat reassured by the guy I was speaking to when he said that once a page had been fully opened, the connection is dropped, so having a few hundred people viewing a site is usually no problem if they are viewing fast loading web pages (which mine are). I am not sure how many users it will take before people start being cued up and the site starts slowing down. Anyway, I have decided to get a virtual dedicated server for the site. I want to be able to use .htaccess to do a 301 redirect from non www to www. So I guess that counts Windows out of the equation. My options are 1. CentOS or 2. Red Hat Fedora. From a bit of Googleing, I have found most people prefer CentOS for its stability, so I will probably go for that unless there are some good reasons to go for Fedora. Any good reasons you know of? I have no idea how plesk, cpanel and the simple control panel differ from each other or even what they do to make them worth the extra money, so any advice appreciated. At the moment, with the windows hosting I have, I just log into my Godaddy account, and manage everything through there site (I guess this is the simple control panel), any files I need to upload, I do via FTP in windows explorer. If adding cpanel or plesk will make life easier for me in the long run, then I may as well add it. But as with choices, which one is better and why? I don't think much ram is required at the moment or if there will be a noticeable differance if I upgrade to the 512mb guaranteed, but more may be required in the future as I add to the site, so I will probably just go for the 512mb straight of the bat. Control Panel: Simple Control Panel, Plesk or cpanel. So, is there anything I am overlooking? Anything you would do different, add or recommend? 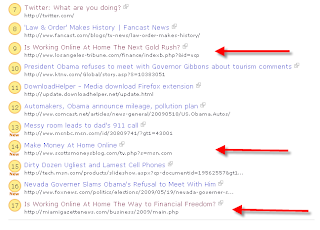 Make money posting links on Google - Yeah right! About half an hour ago, after I had finished checking one of my sites "Alexa rank", I decided to have a look at the Alexa "Hot URL's". I was suprised to see a familiar looking URL at number 5 on the list of hot URL's that I have seen mentioned several times before in a few differant discussion groups. The title of the link is "How I Make $5,000 a Month Posting Links on Google". The URL usually goes something like kevingotgreen, kevingothisgreen or in this case kevinsgreenblog. com. The questions in discussion groups are usually something like... "Posting links on Google - Is it a scam?" The majority of answers are "Yes, its a scam"
So when I saw the scam site ranked at number 5 on the hot URL list, I couldnt help but cringe at the thought of all the potential victims this scam may get again. Although the site looks very scammy (to me anyway) there are a lot of people that are taken by the promises of easy money. Hopefully the authorities can step in like they did with the "GoogleMoneyTree" scam, before too many people get ripped off. 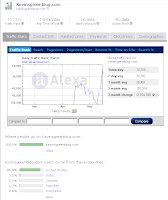 Looking closer at the Alexa hot URL list, I noticed another link to a site (this time at number 2) that was titled "Is Working Online At Home The Next Gold Rush?" I thought to myself "How ironic!" But then cringed again as I thought, "I wonder if this could be a scam site as well?". Looking at the URL in the link, gave me the impression that it was a legitimate site. So I visited it and took a closer look. Los Angeles Tribune News (Losangeles-tribune.com/finance/indexb.php) Looks like a normal news site (and that's the scary part), reporting about a successful "Working online from home" story. But dig deeper, and you will soon realize that it is just another "post links on Google scam". If you Google the keywords "Losangeles-tribune.com" (without quotes), latimes.com comes up as the first result (as it should). The second result is from quantcast.com (a US only version of Alexa) which estimates 84,543 US people a month visit the site. If that number were correct, then that's a lot of potential victims. The fact that the domain was only registered one month ago, and has a 16733 quantcast rank, could also mean that those numbers are likely to be a rough estimate and the true numbers may be a lot higher. The sites domain, design and layout make it look somewhat trustworthy and that increases the chances of people falling for the scheme. Losangeles-tribune.com's website is not on the first page of Google for its own domain name. (some sort of sign maybe?) But it sure is getting a lot of traffic from somewhere. Some more information about these sites. Owners details hidden by proxy. "another part time job work at home money making scheme. This time it’s losangeles-tribune.com pushing the Easy Google Profit scam and stars our old friend Mary Steadman from Mary’s Money Blog." Warning: Why would he ask for you to pay $1? Answer: to gain access to your credit card! See this page for an account of what happens. Just thought I would add, after I made this post, I refreshed the Alexa Hot URL's page, and found a couple more "Make money online scams" in the list. 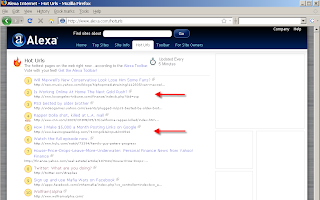 This site links to rts.revfusion.net /p/ f8c4..., When you Google revfusion.net, there are a number of referances to Ad Block filter lists. Beware folks, and remember the saying, If it sounds to good to be true. Looking at the list, I was surprised at how many there were. I didn't even know half of these extensions existed, and to be honest, I hadn't heard of some of the Countries in the drop down list either. I found and added one Google TLD that was missing from the WMT's list (google.me). I am not sure how complete this list is, but thought I would post it anyway. Will add any others as I discover them, If you know of any that are missing from this list, please leave a comment and I will add them.